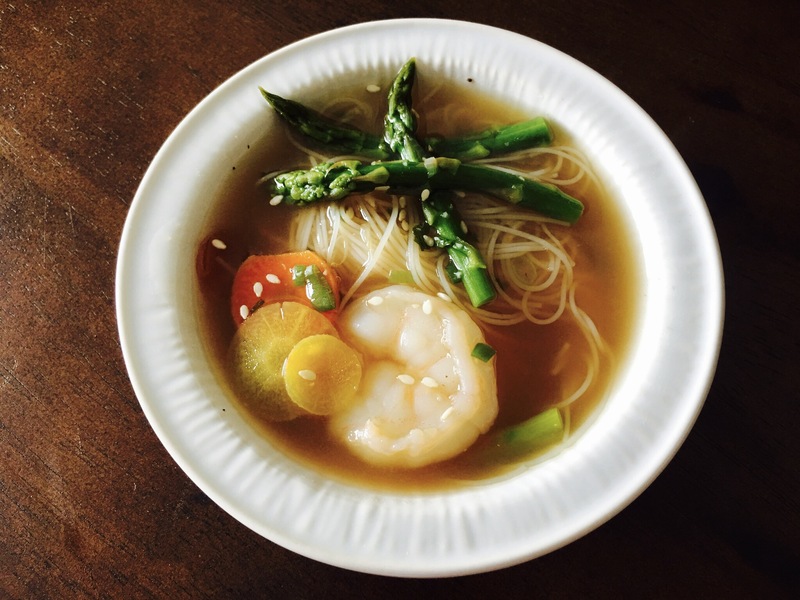 Shrimp and veggie soup with asparagus and rice noodles in 15 minutes – Hurried Home Chef! 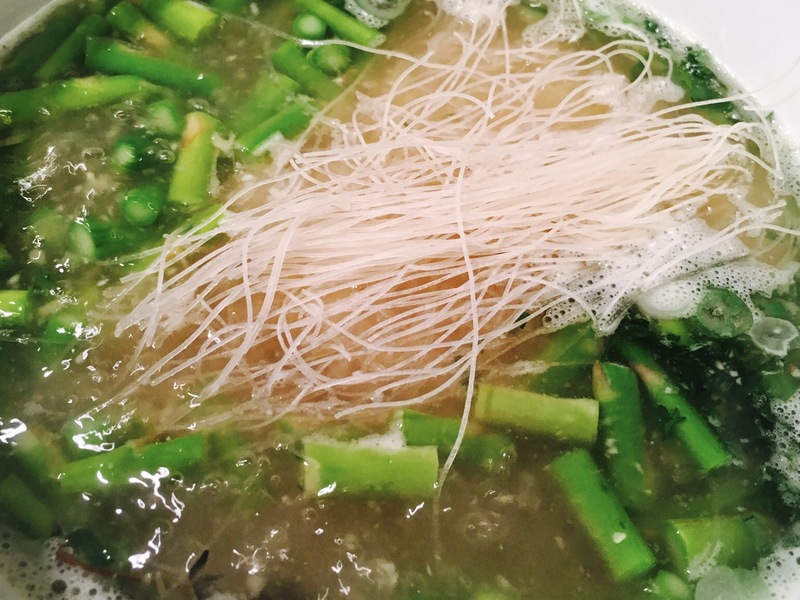 I like making quick soups with some already prepped ingredients I keep lying around. 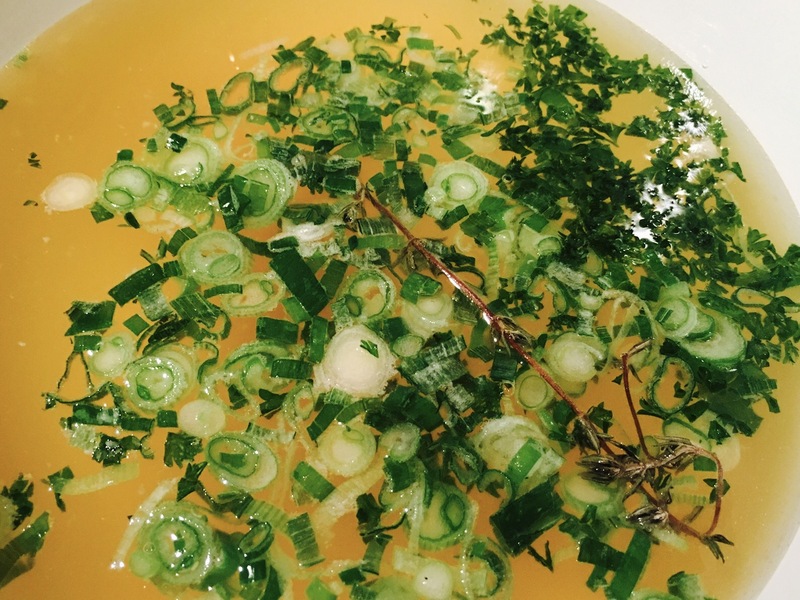 First I add store bought stock–about 2 cups per person, usually chicken, depending on my crowd and if I’m making it vegetarian or not. If so, use vegetable stock. In my freezer I have chopped green onion, parsley, and thyme. In the fridge, I have ginger and garlic paste, add about 1 tsp of each. If you like heat, add some sriracha too. Bring to a boil. I had some asparagus hanging around, so I added it next and let it cook for about 2 minutes. The add some rice noodles, and let them cook for about 2 minutes. Taste at this point and see if you need more salt. You can also add some soy sauce if you are ok with gluten, or the liquid aminos if you’d prefer. I had some rainbow carrots that I finely chopped with a mandolin, and previously blanched asparagus tips, I added these. Then I poached some peeled, deveined shrimp, once it is boiling, turn off the stove and cover. The shrimp will cook in about 3 minutes. Top with some sesame seeds, cilantro, micro greens, or lemon grass finely diced. 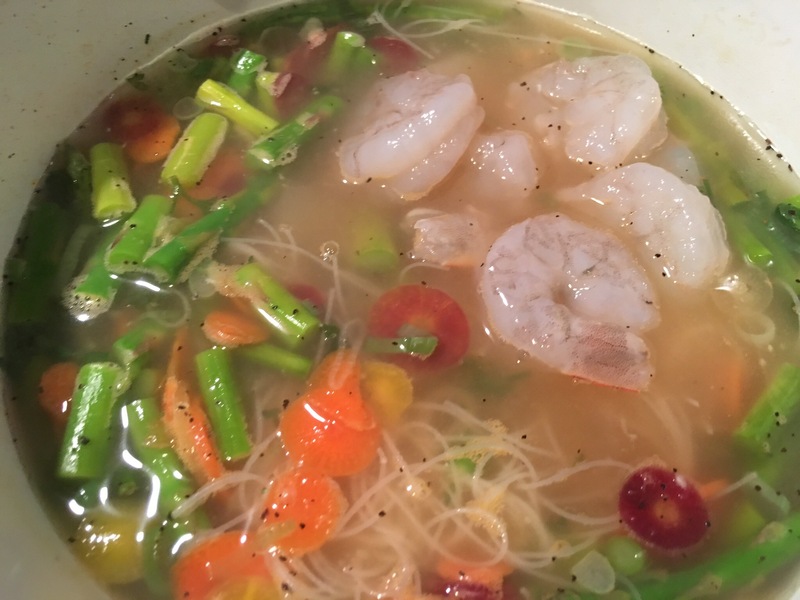 2cups stock per person, 5 shrimp pp, vegetable of choice like asparagus/spinach/bok choy/edamame/carrots, garlic and ginger paste, rice noodles, sriracha/salt/pepper to taste. Previous Post Spiralized beets with spicy chicken thighs, quinoa and brussel sprouts.